Gionee is set to launch its newest smartphone in the Gionee M series, its called Gionee M7. The Gionee M7 will be unveiled in china soon. It said that the phone will have full screen display with ultra-narrow bezels, similar to its teaser. 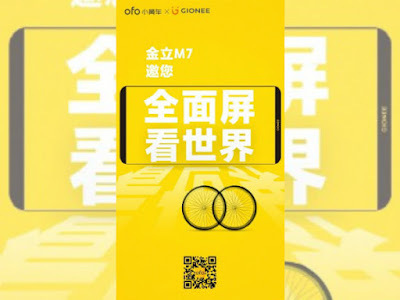 The company has officially teased a promotional poster of upcoming Gionee M7 which shows the device with no bezels at sides while very thin bezels at the top & bottom just like the other full-screen devices.The teaser talks about collaboration with bicycle company Ofo for “doing things” and comes with a tagline of “M7 Joint card invites you to see the world in full screen”, clearly indicating that the phone is designed with full-screen as confirmed by the phone image in the teaser too. Other details has revealed on GFxbench listing revealed a 6-inch (2160 x 1080 pixels) Full HD+ screen with 18:9 aspect ratio, latest MediaTek Helio P30 SoC, 6GB RAM, 64GB storage, Android 7.1.1 (Nougat), 16-megapixel rear camera and an 8-megapixel front-facing camera.